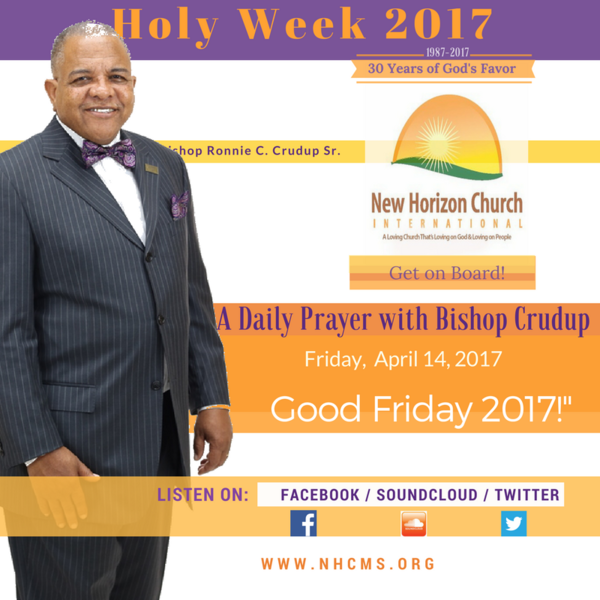 Audioboom / Friday, April 14, 2017, A Daily Prayer With Bishop Crudup, "Good Friday 2017!" For Good Friday, April 14, 2017, Bishop Crudup's prayer is entitled, "Good Friday 2017!" The year of 2017 marks the 30th Anniversary of New Horizon Church International, of Jackson, Mississippi. Saturday, April 15, 2017, A Daily Prayer With Bishop Crudup, "He Lives!" Friday, April 28, 2017, A Daily Prayer With Bishop Crudup, "The Good And Great One!" Monday, April 24, 2017, A Daily Prayer With Bishop Crudup, "The Good God Who Suffers With Us!"